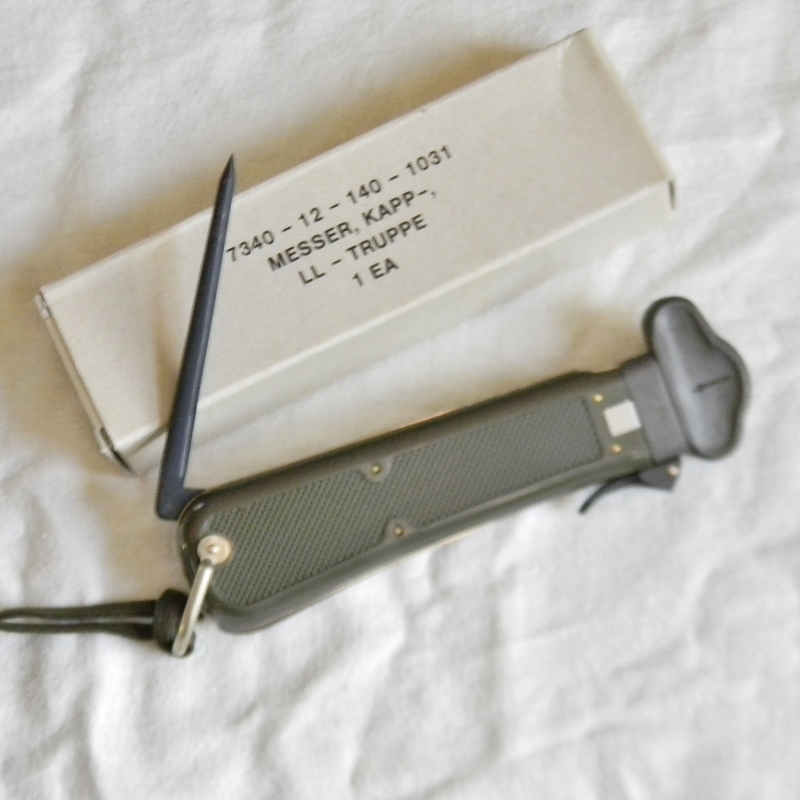 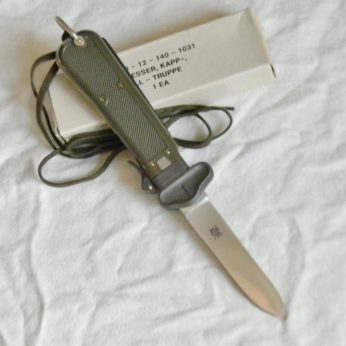 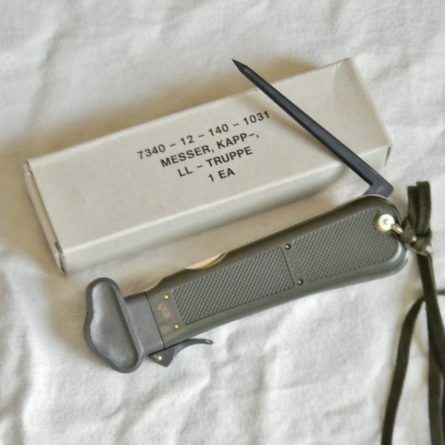 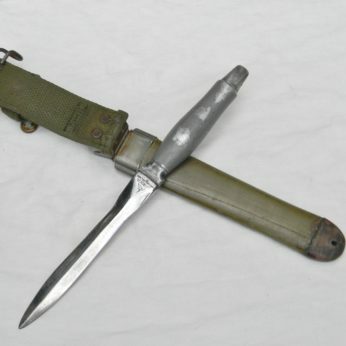 Original Cold War era West Germany military large LL-TRUPPE model paratrooper gravity knife (Fallschirmjäger-Messer) in rare mint condition and still in the original box of issue; long-discontinued military knife. 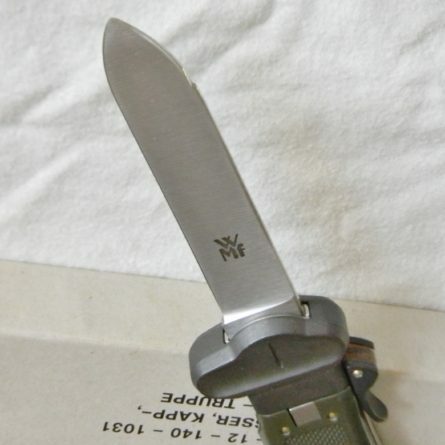 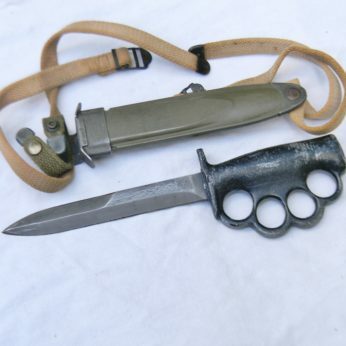 This is the post-WW2 German gravity knife was manufactured circa 1961-1979 (Type II) by Worttembergische Metallwarenfabrik (WMf logo is etched on the blade) – see a dedicated German gravity knives page on Wikipedia. 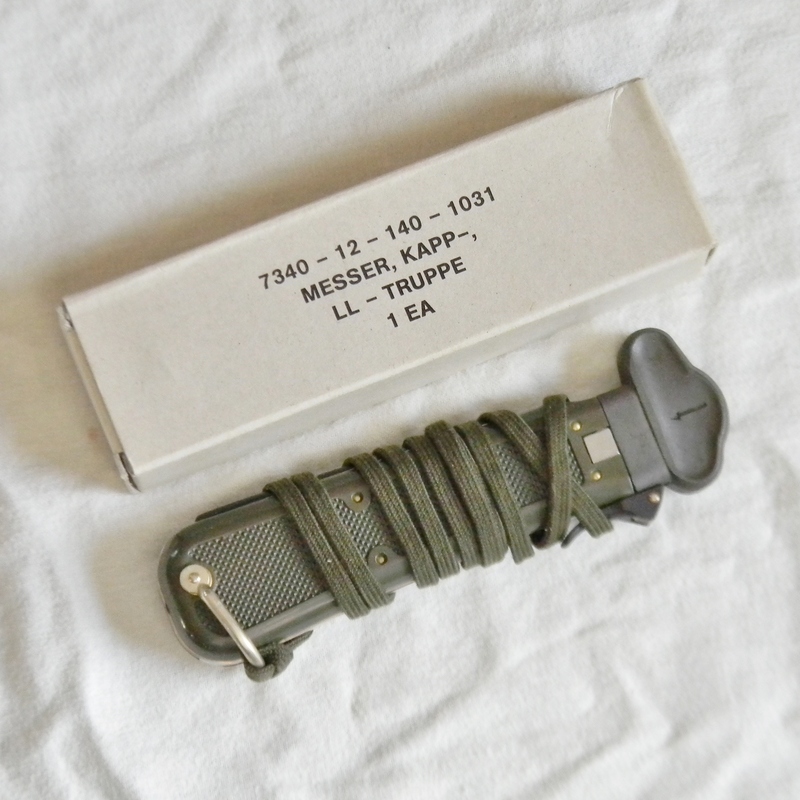 Rare mint condition & complete with original green lanyard and correct packaging; VERY hard to find this nice. About 6-1/4″ / 16 cm closed; the blade is about 4″ / 10.2 cm long; original edge is razor-sharp; the tip is intact; the blade is finely etched WFf. 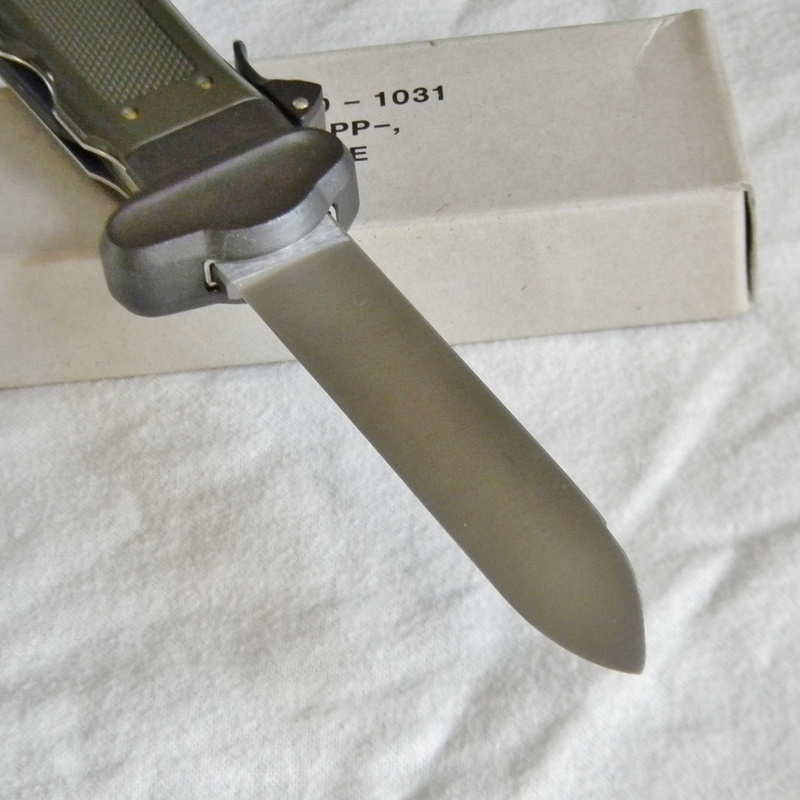 Heavy-duty spike with a needle-sharp tip is about 3-1/2” / 9 cm; bolster is a solid die-forged chunk of steel. 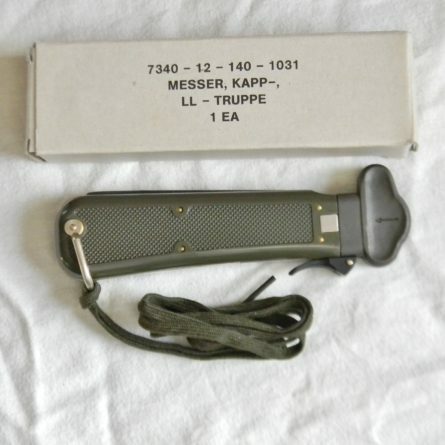 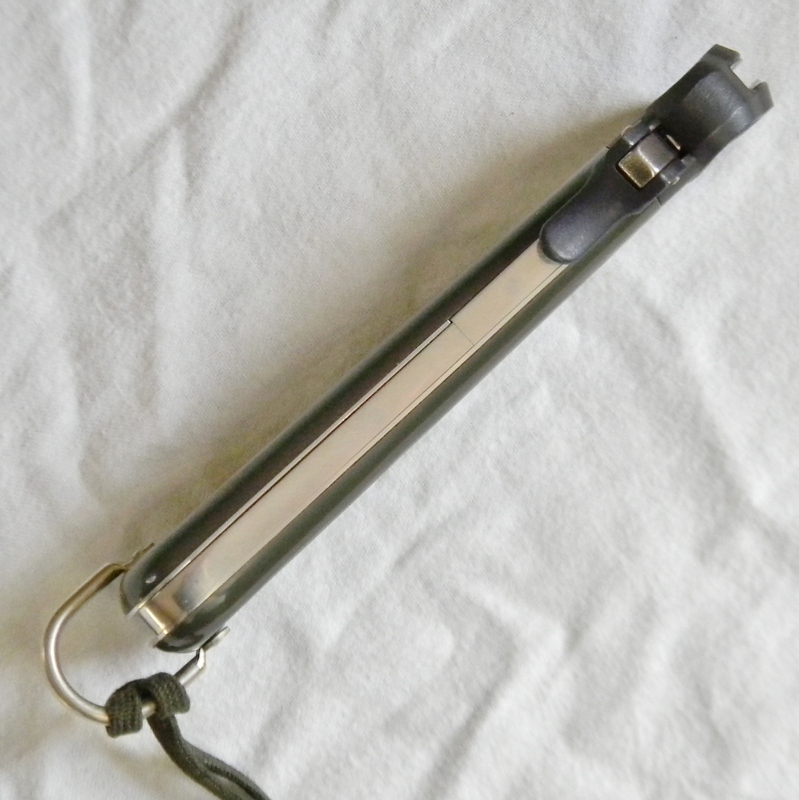 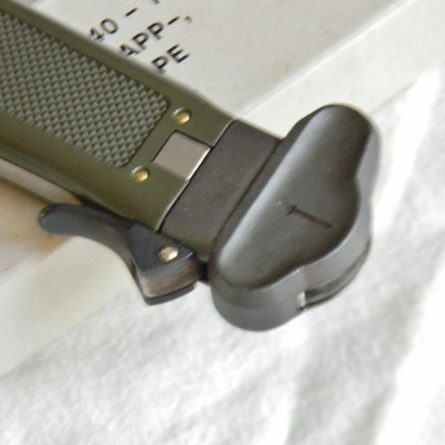 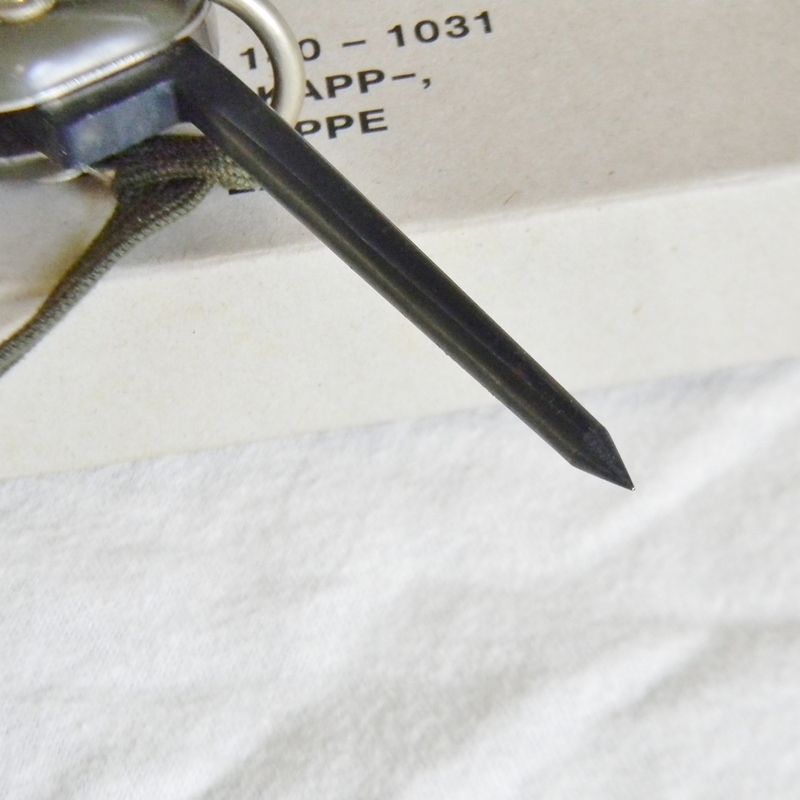 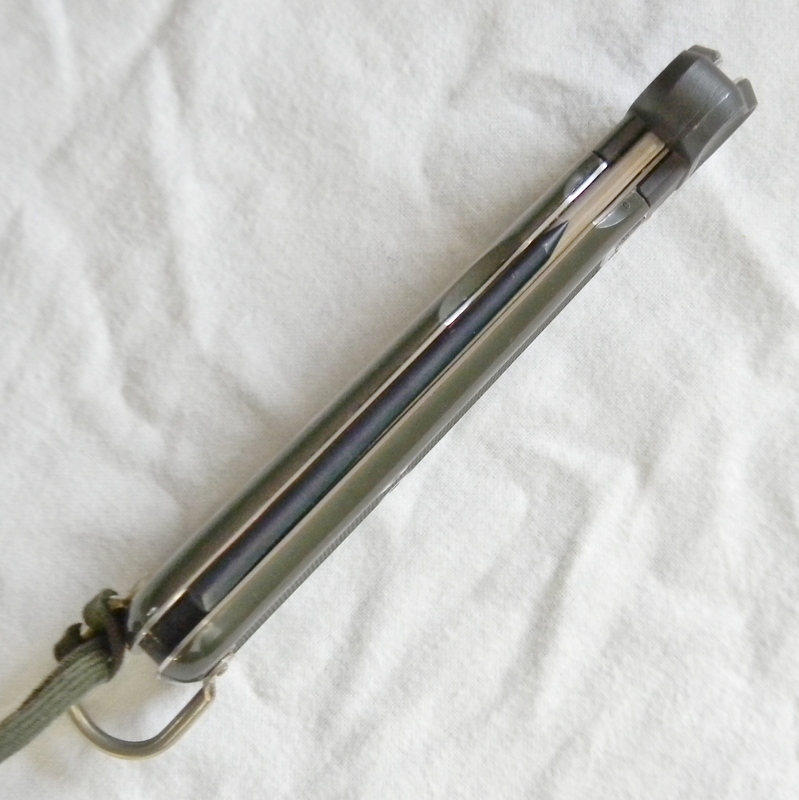 Handle scales are made of high-impact olive green plastic marked BUDD on a side (BUDD is for Bundeswehr – Cold War era West Germany’s Armed Forces). 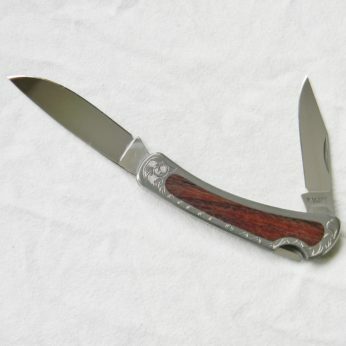 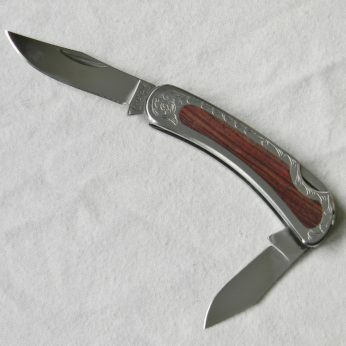 The knife could be easily taken apart for cleaning and maintenance by pressing on a small steel square below the arrow – steel bolster comes off & you just slide the handle half sideways. Once exposed, the blade can be completely removed by pulling on the blade lock; quite an ingenious design for a military-grade knife! 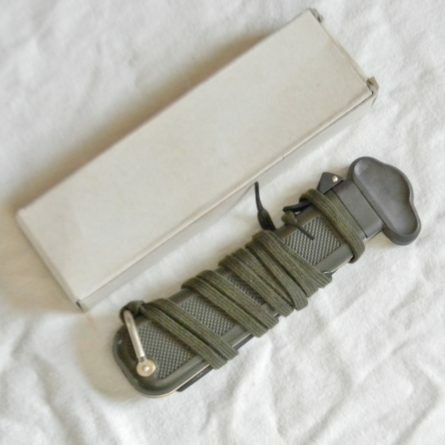 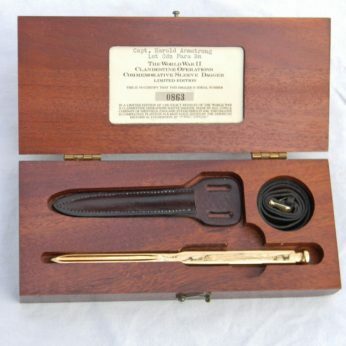 This Cold War era West Germany WMF Paratrooper Gravity Knife MINT condition AND still in original packaging is something that doesn’t come up for sale very often; don’t miss your chance to add it to your collection! 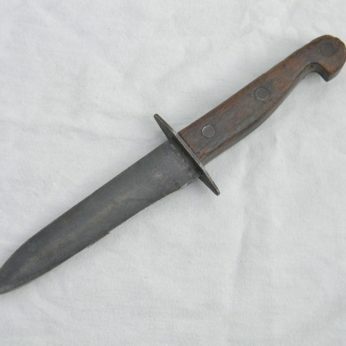 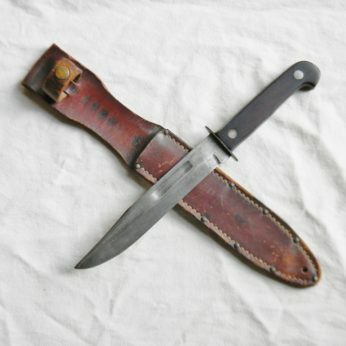 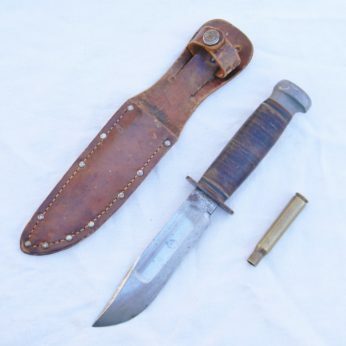 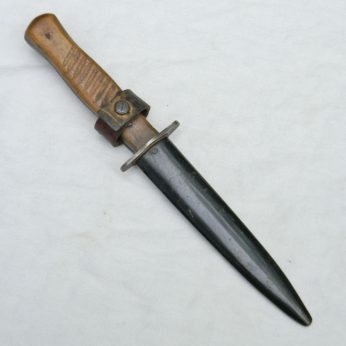 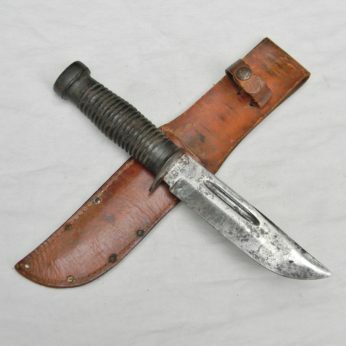 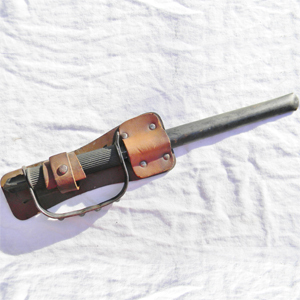 Don’t forget to check out our Militaria section for other military knives and gear, including several vintage WW1 and WW2 era fighting knives, original WW2 USAF Pilot Knives, and a couple of rare WW2 “OSS Drop” knives we still have available for sale.